Hi everyone! It's Jennie from JD's Rockin' Readers. 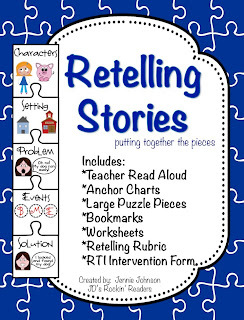 Retelling stories is a BIGGIE in the world of Common Core so I feel like I need to start teaching it soon- very soon. Don't you just love when your little friends try to retell a story and they just don't quite get it? You know what I mean- they start in the middle of the story or their retelling is all of one sentence? Over the years, I have had many students who struggle with how to retell a story. I have found that just having a visual for them to look at has been a big help. 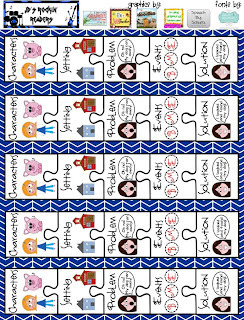 I have a FREEBIE bookmark for you today that is a great visual for when you are teaching how to retell. I just print these on tagboard, laminate, and cut. If you are working with older students, here is a great information page that they would be able to use to help them out. Have a fabulous month and I will see you on October 15th!